It’s holiday time…..so we’re off to do something fabulous in this 60 degree sunny weather. Even if fabulous just means taking a stroll around the neighborhood. And maybe grocery shopping. At least we can tag team the children at the store. It’s holiday time….nothing like a good trip to the grocery store. Anyway, I just wanted to post real quick. 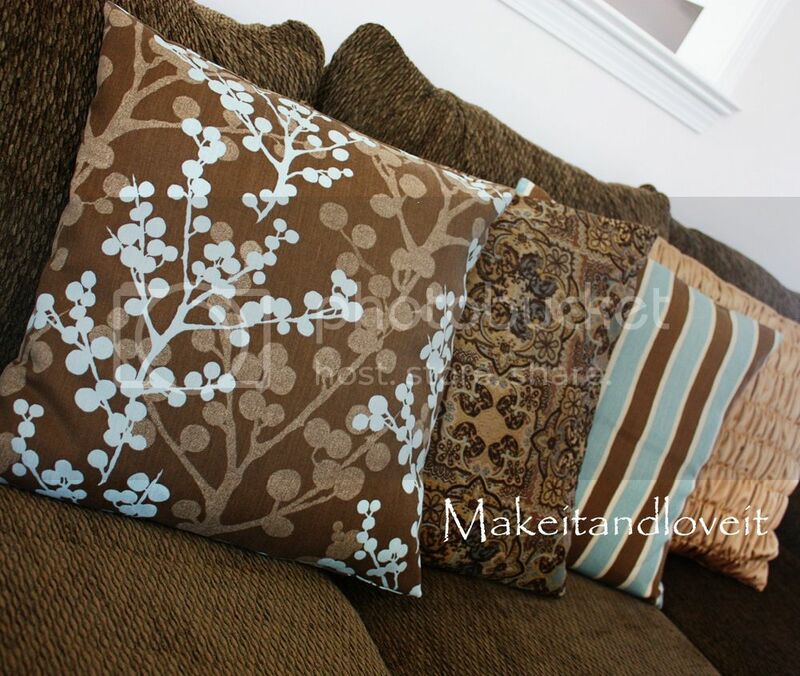 Many of you have asked and emailed the pillows pictured with the gathered pillow………shown here. All the fabric from these pillows I found at Hancock Fabric, during their 50% off upholstery sale. Great find and a great price. They have similar sales pretty often. And I used the Pillow Slipcover tutorial found here. Now, go and enjoy your day…..especially if you have the day off too. I came across your blog and love it! I just started sewing bu love all your ideas! Love the Pillows! Do you remember the name of the flowered fabric. I have been looking for something exactly like this forever! I just made six panels of the brown/blue fabric for my bedroom windows! What a small world to finish the project and come across your site today. Great site, and I LOVE your taste! Ha ha. By the way, to Melissa, the fabric is called Langtree at Hancock's and watch for another sale! Haha….Julie, how funny is that! And thank you, I had no idea what the name was. Sorry Melissa and thank you Julie! Love your pillows. Im feeling inspired today! Thank you Julie! Can't wait to go shopping! You are oto much! And why am I not allowed to view your blog anymore? And where are you now? And why don't you call… I can't find your cell number. Call or email me! Just found your blog…lovely pillows!